Despite the fact that I own eleventy thousand reusable grocery totes, I always end up with a pile of plastic bags. Crunchy, flimsy, entirely eco-un-friendly plastic bags. I already have a lamp. Hey, I know, here, let’s make a festive garland. 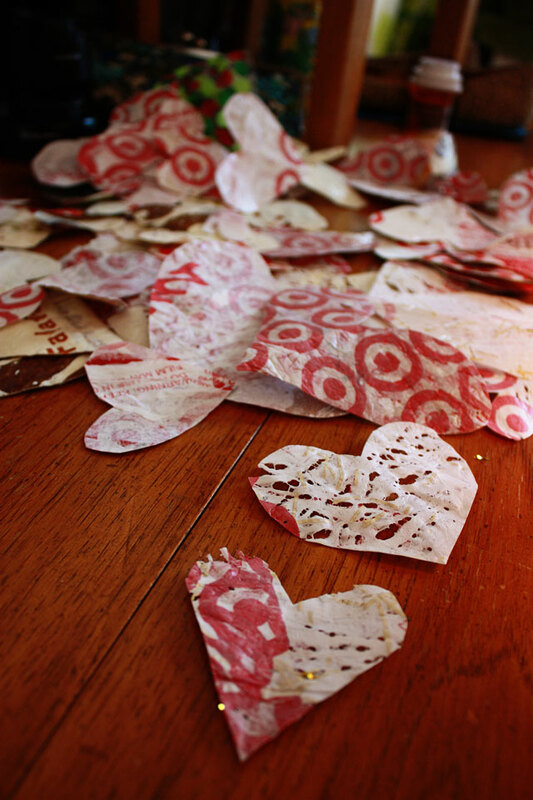 It will look like those nifty crayon hearts but more gruff and tumble. Let’s make some hearts with rock n’roll soul! The amount of bags will depend on how thick you want your hearts. I started with 20ish (later divided into stacks of 3). First, cut of the handles and trim off the bottoms –the end result will look like a big flopsy tube. Important: turn them inside out so the print faces inward and away from your iron or you will end up with a big ink mess. Get your iron hot and go to town! 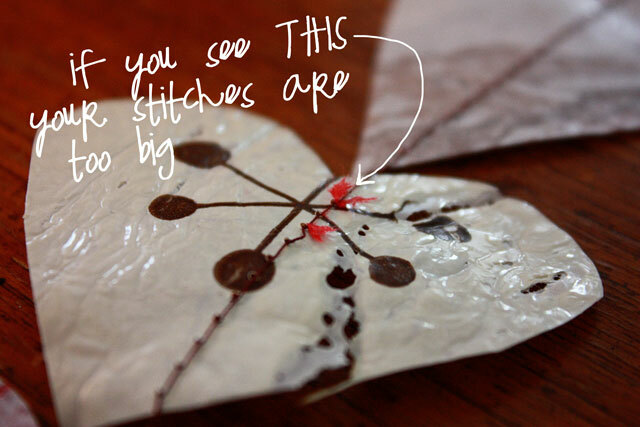 Keep your iron moving around for about 15 seconds then lift up the parchment to see what you find. It could be melted to bits with tiny, lace-like holes; it could be thick and solid—results vary widely depending on the grade of plastic bag. Give it a minute to cool before you peel it away from the parchment. The end result will feel like a big plasticy potato chip. *Note: I use the hottest setting on my iron because I like to get it good and melted. If you want flakey biscuit looking hearts, use the lower settings and check more frequently. Cut out your hearts. Lots of them. It’s the same as cutting paper and it’s easy. Read: Get a kiddo to do it for you. 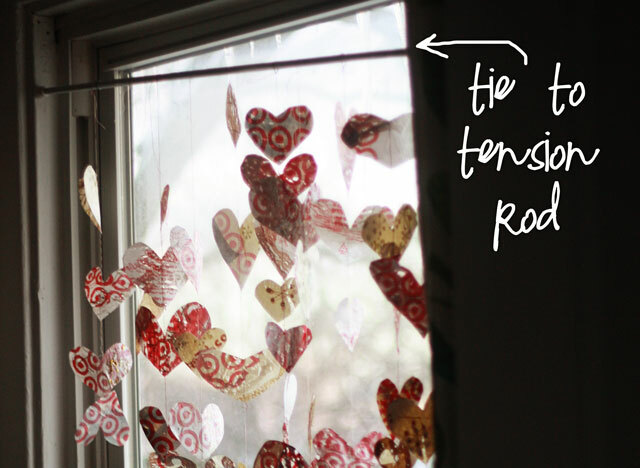 I think they look pretty nifty as is, but if you want to string them into garland, read on! 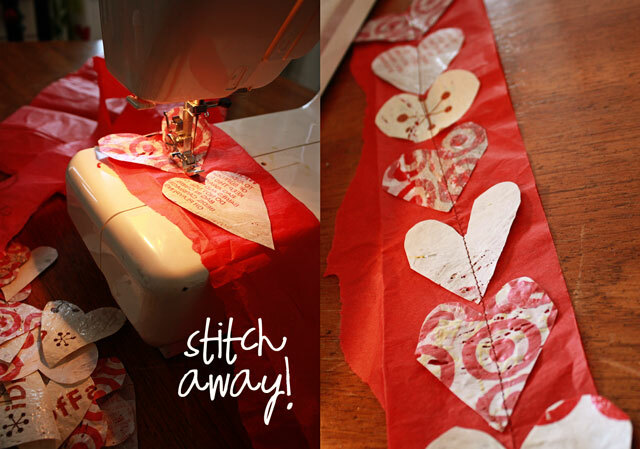 Sewing the hearts by machine is super easy –just lay down a strip of tissue paper and stitch a solid line, randomly inserting a heart every few inches (the tissue paper will prevent the machine from snagging between the hearts). Tear away the tissue paper from the hearts. I find this part oddly cathartic. 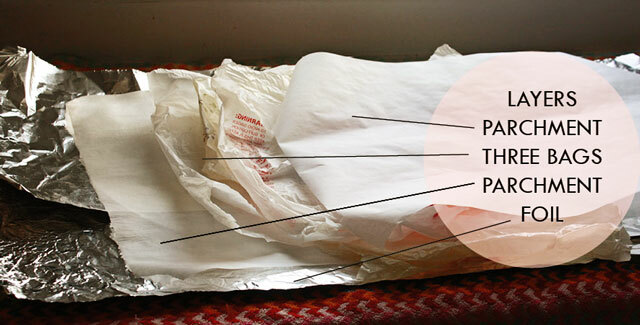 If the tissue paper snags when you tear it away, try tightening the stitches. I chose to tie my garlands on to an old tension rod and hang them in the window, but I think, after Valentines, I might try restringing them onto a lampshade or something. Or maybe cut them up further and string them into a necklace. Something funky. This is one of those projects that was a snap to make but difficult to photograph. My camera skills struggle to capture the light coming through each one of the hearts, each more red and luminous than the last. 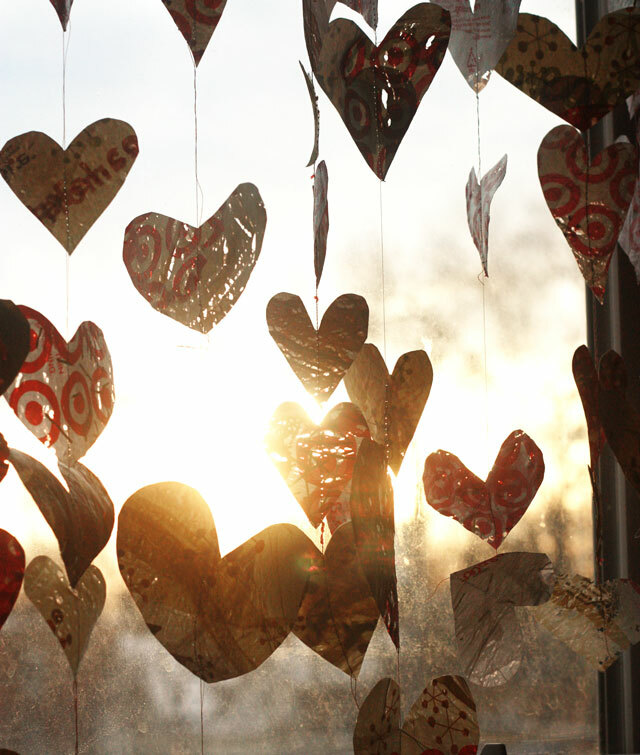 Winter mornings can be a real downer–these hearts are a welcome sight. I’ve been reading your blog for a while, but this is the first time I’ve left a comment. 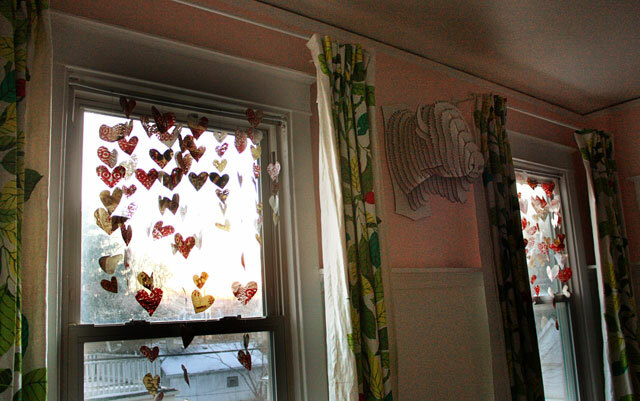 I totally enjoy the fun valentine garlands, and the zest and pizzazz you bring to recycling/upcycling things. I confess though, my attention was stolen by your curtains. I love, love, love your curtains! Not even your awesome buffalo trophy could distract me from them! woohoo! Target bags AND a handsome buffalo! What’s the word on the Valentine Swap? I’m in super-craft mode and wanna get started early! Beautifulllllll, Peaches! Thanks for such a complete tute, I needed it, having never ironed plastic bags before. Genius use of target bags! love it! so have to try this……! Cute cute cute! Loved seeing the how to! gosh that’s pretty. I agree with Mr. Buffalo. It’s Valentine’s Day! What’s not to love eh? soooooooooooooooooooooooooooo ready for the Valentine swap!!!! as is, obviously, Mr. Buffalo. they look great hanging in the window like that! 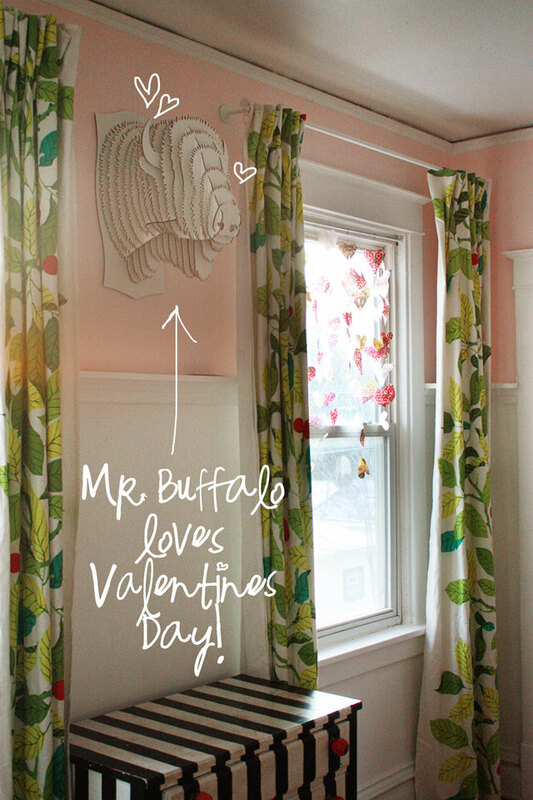 mr buffalo is awesome 🙂 so when are we organizing this valentines swap?? i’m with lynne, soooo ready for it!! also, i’m still down to do a hunger games crafty linky party, maybe post about that on here and see who’s interested?! it would be too much fun. oh how beautiful! I have heard of ironing plastic bag shapes on t-shirts but I never thought of having them stand alone. Love Love Love it! Thank you for sharing this great tutorial! My Little Miss Sophie is ready to get cooking on this project – SO FUN! LOVE LOVE all you have to share all the time. THANK YOU for a fun and refreshing read! Okay, I have to ask — have you shared the color of the pink paint in your dining room? Or would you? Bceause it’s the mostest perfectest pink paint ever. This is a great project! 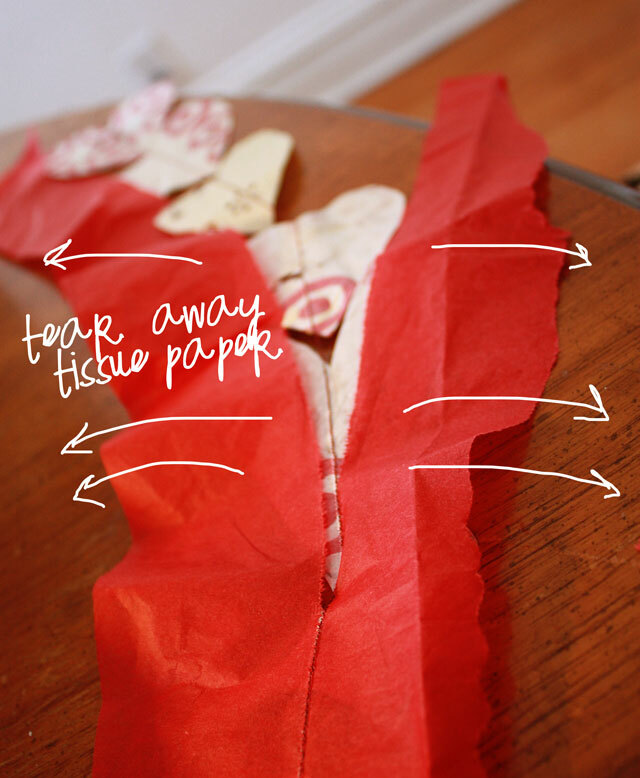 I’d love to do this for Valentines Day! Thanks! Love this idea! This would even make a great garland for a Christmas tree!. And I love that little black and white striped bureau – dod you paint it? wow. now the possibilites are endless. I was thinking of doing different shapes and hanging them in a doorway in my daughters playroom. thsnks for a great idea. 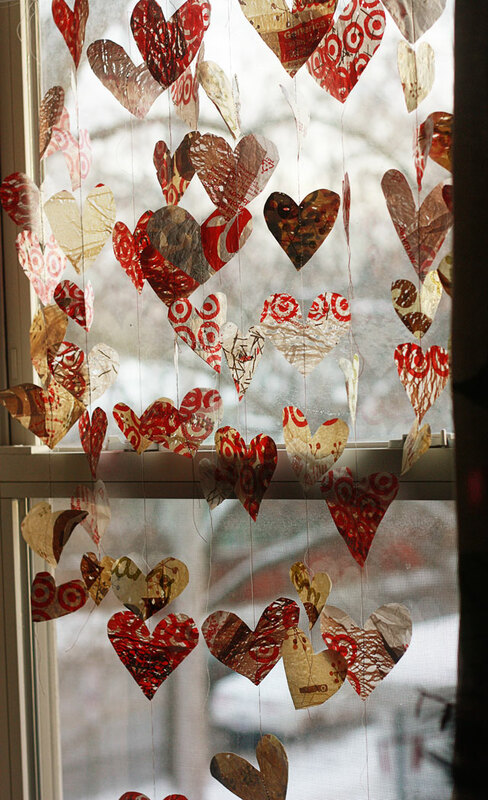 ..
You could also use nylon or plastic thread and iron it into the hanging arrangement of fused heart cutouts instead of sewing them.